The world of Hindustani Classical Music comprises of Geniuses both vocalists and instrumentalists. Their music emanates a divine spark. Be it their first recording or a phase of experimentation or perhaps a time when thy reached a crescendo in their careers each of these is a slice of history. And we at Saregama are proud custodians of these immortal moments. In this series we have compiled some of the finest performances of the legends thereby showcasing the genius of these Geniuses!. 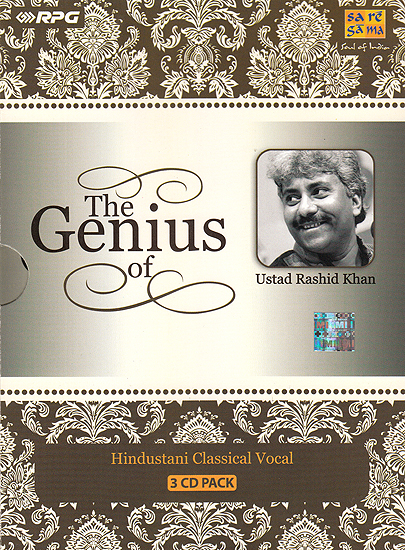 Ustad Rashid Khan is the Indian Classical vocalist of the 21st century the one Indian vocalist who establishes the bar of Indian vocalism as supreme in the international music sphere. Any listener from any culture or geographical region on this planet is bound to be moved astounded by the superhuman extraordinary and divine texture of that voice that sensibility and that expression that emanates forth from Rashid Khan in Cascades of flowing genius. Scion of the Rampur Sahaswan Gharana this most outstanding of disciples of Ustad Nisar Hussein Khan took the world by storm as a 15 year old prodigy in 1980. At that tender age his voice sounded had the gravitas power, agility richness and sheer magnificence of a veteran. He was hailed as a reincarnation he was obviously born with an uncanny inheritance of inner knowledge of music that was baffling. His utterly beauteous badhat his lightning tans his layakari and the crackling energy and finally the laser precision of every movement in pitch and timbre presented an experience that had to be head to be believed. “ Deem dara Dir Dir”.